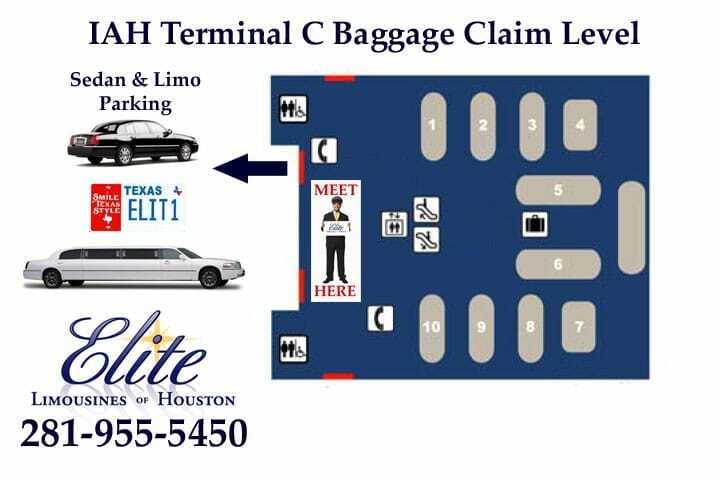 General Airport Meeting Information: Elite Limousines Sparkling Service Professional Chauffeurs will be looking to meet you with a greeting sign (with your initial and last name on it) on the baggage claim level. To avoid confusion, please proceed to baggage claim whether you have checked luggage or not. With rare exceptions, your chauffeur will be wearing a black suit, a white shirt, and our signature gold tie. 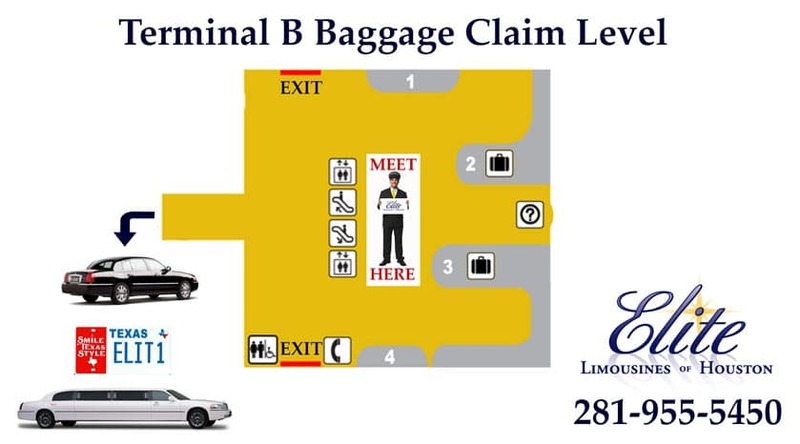 We recommend that you locate your chauffeur before going to your baggage carousel; this will allow your chauffeur the opportunity to assist with your luggage and make your travels even more enjoyable. 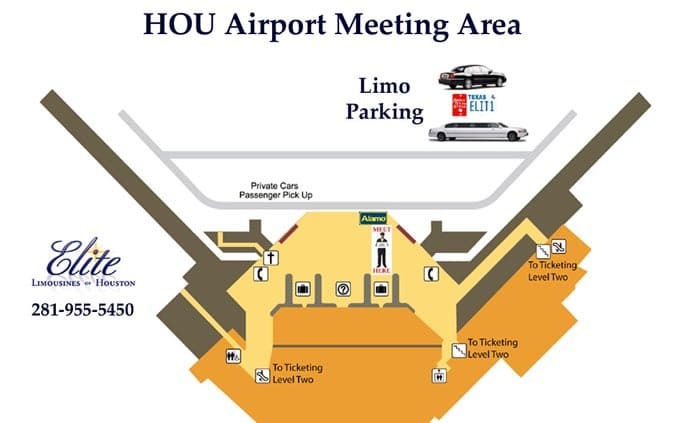 Airport terminal specific information is below, but as a rule, look for your chauffeur on the baggage claim (ground) level of each terminal and do not go outside the terminal. 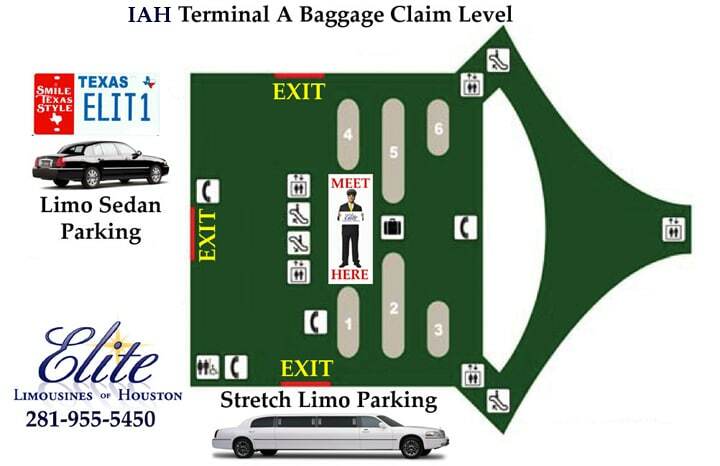 Call 281-955-5450 immediately if you cannot locate your chauffeur. If you arrange other transportation without contacting us we will wait for you one hour and trip charges will apply. Note: Although you may arrive at D, there are very few flights that actually exit at terminal D; these are mostly international flights that went through customs during a stop in another US city and then continued to Houston. Most travelers will proceed to customs in terminal E (see Terminal E info below). Please do not go outside the terminal. Terminal E: All travelers required to go thru US customs will have to go to terminal E: the International Arrivals Building (IAB). Proceed thru customs and then the secured exit doors and meet your chauffeur on the arrival level near the exit stanchions after exiting customs. Starbucks will be on your left. Please do not go outside the terminal.